In the event an animal dies in your wall, ceiling, attic, crawlspace or anywhere else on your property, we remove and disinfect the area. The area is then sprayed with an odor neutralizer. Insulation of attic and crawl spaces due to lost R-Value (insulating efficiency) caused by animal and rodent damage, urine/feces or if they’re just old and dusty. We will replace your damaged insulation with non-formaldehyde insulation. Attic fan covers prevent animals such as squirrels & raccoons from gaining entrance to your attic area. Attic & gable screens can be installed to help prevent raccoons, squirrels, and any other unwanted animal from entering your home in these susceptible areas. Exclusion is done in a natural and harmless way, but it must be done during the right time of year. Exclusion is done in such a way as to prevent the bats from reentering the structure. While bed bugs are usually not dangerous, they are still a nuisance. Their bites create noticeable marks on a person’s skin, and they are known to sometimes cause allergic reactions. However, we provide services which eliminate bed bugs, while preserving the well-being of your home. We offer effective bird control methods for Canadian geese, ducks, pigeons, seagulls, starlings, sparrows, woodpeckers and other types of birds. We have a large variety of tools at our disposal including antilanding devices such as bird spikes, shock tracks, bird slopes, bird wire, bird gel and bird nets. Electronic devices include both sonic and ultrasonic systems, while visual and taste deterrents include FlightControl PLUS and Irri-Tape. If all else fails, we may employ daily constant harassment using dogs, lasers, decoys, cannons and hazing. 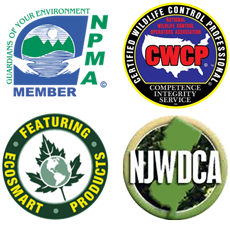 We offer control services for black bears posing problems throughout New Jersey. The removal of brush and debris away from the home takes away the habitat that insects, rodents and other types of wildlife use for cover. The installation of chimney caps prevents animals, such as raccoons, squirrels, opossums, bats, flying squirrels, birds and wood ducks, from entering the fireplace or your home. Chimney caps are available in stainless steel, copper, galvanized or black. Because the cicada is a flying insect which tends to land extremely high in the treetops, there are not many types of treatments to eliminate them. However, by applying the surrounding brush and spraying the trees as high as possible, there is a chance of reducing the amount of cicadas as long as they come into contact with the chemical. We provide a thorough treatment for those wishing to prevent cicada invasions, but there are no guarantees for this service. We replace crawlspace vents to help alleviate moisture and provide ample cross ventilation. A well ventilated crawlspace will help prevent damage to your wood and insulation. It will also prevent moisture thriving insects from entering your home, such as rodents, snakes, termites, carpenter ants, crickets, silverfish and more. Deer culling consists of thinning out the herd by means of shooting. This is usually done on farms, estates, or other types of property where deer are causing extreme damage or safety issues. Let us disinfect the drains in your home or place of business to remove odors, drain flies and sugar snakes (from soda fountains). Dryer vents should be cleaned at least once a year to help prevent fires & allow the clothes to dry faster – saving money and energy. Our dryer vent cleaning system allows us to work from the exterior of your home and will remove the buildup of lint. Placing physical barriers to prevent access and pest proliferation can be highly effective. Services are provided in order to harmlessly capture feral cats which pose a problem to your property. Control services are offered to properly capture foxes and coyotes that begin encroaching on your home or business. We offer humane groundhog control methods for your groundhog problems in New Jersey. Cleaning gutters helps prevent moisture build up that can cause wood rot, mold, breeding of mosquitoes & the infestation of termites & carpenter ants. Pest Armor Gutter Protectors will keep your gutters clear of debris and leaves. We offer humane wildlife control methods for groundhogs, raccoons, opossums, skunks, squirrels, flying squirrels, chipmunks, bats, mice, snakes, rabbits, muskrats, beavers, geese, seagulls, woodpeckers, moles, coyotes, foxes, feral cats, deer, turtles and more. All animals are HUMANELY trapped and relocated. We treat cracks & crevices with copper mesh, silicone, cobra or IPF foam. This is a great preventative measure to help alleviate rodent and insect pests from entering your home. After a thorough inspection of your home’s interior and exterior, all cracks & crevices will have a residual pesticide applied followed by a sealant when necessary. We perform property & estate clean outs – trash, wood, metal, roof shingles, sheetrock, insulation.. you name it. Rodenticide is one of the primary methods of eliminating mice, rats or other rodents from a domicile. But sometimes old-fashioned mouse or rat traps are sufficient to eliminate the problem. Rodent prevention may be done in the form of an exclusion for an entire structure. This entails sealing all cracks, crevices and other openings which may serve as a point of entry. Our odor neutralizer will destroy the odor – whether it’s caused by skunks spraying, dead animals, pets, mildew, smoking and more. This is not a masking scent; this is a malodor destroyer that attacks the enzymes making a permanent solution to your odor problem. Opossums may live in your attic, or under your deck or home. They steal pet food, bird seeds, and may alarm your pets. However, humane control methods are offered to handle these opossum problems. Otter control services are provided for ponds, streams and pools. Power washing green and black mold off your home helps it dry faster and not retain as much moisture. This will help in reducing the infestation of moisture thriving insects and prevent wood rot. Raccoons have a habit of living in human dwellings. Fortunately, we provide humane control services to keep raccoons out of unwanted areas. We are fully equipped to remove raccoons from your property, or prevent them from encroaching upon it in the first place. Wood destroying insect (WDI) inspections include inspecting for termites, carpenter ants, carpenter bees and wood boring beetles. This is not just a termite inspection as some may believe. Call us for an honest (WDI) inspection. All findings are recorded for your benefit. Do not feel pressured to use a realtors inspector, call us for a prompt, honest and thorough inspection. Removal of dead deer on your property or roadside is provided for residential, private, state, county or township. Call us for a quote for Road Kill Removal services. We offer trapping programs as a solution to remove unwanted skunks. After successful removal, we will seal the entire perimeter and warranty our work. We can remove snakes from your home or place of business. If you find a snake and you do not know whether or not it is venomous, the safest thing to do is leave it alone and call us – we will come trap it for you. If anyone is bitten by the snake, you should seek medical attention. Do you have a beautiful koi pond and have noticed that some of your fish have gone missing? You may have a snapping turtle problem on your hands. Snapping turtles are considered an endangered and nongame species and should be handled by a professional. Our technicians are expertly trained in this field. Sealing an entire structure is generally the best way to avoid squirrel problems – especially squirrels in the attic. Some may opt for only sealing the entrance hole, but a full warranty is not provided for this service. Sealing weak areas, such as ventilation areas, are also a good way to avoid problems with squirrels. Replace damaged wood in crawl spaces, sill plates, and walls. Tree branches should be trimmed far enough from the home to help prevent squirrels, raccoons, opossums, rodents, flying squirrels, ants and other pests from accessing the roof and other areas. Tree branches should be trimmed far enough from the home to help prevent squirrels, raccoons, opossums, rodents, flying squirrels, ants and other types of insects from accessing the roof from those areas. Vapor barriers are installed in the crawlspace area to help prevent moisture from rising up and causing damage to your wood and insulation. This also helps to prevent the proliferation of moisture thriving insects.